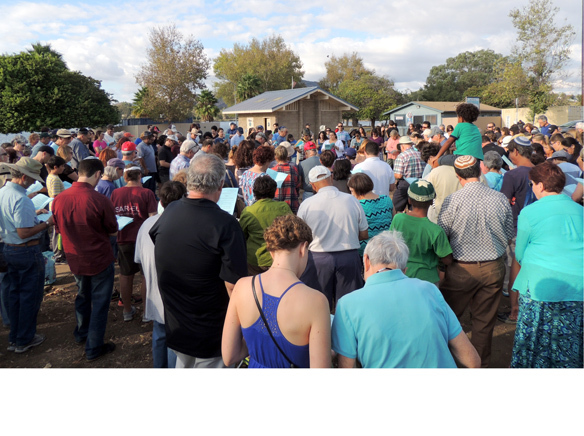 On the evening of Sept. 14, hundreds of people from Temple Emanu el, Tifereth Israel Synagogue and Tree of Life gathered in a circle at Lake Murray. They sang songs in Hebrew and English to celebrate the traditional Tashlich service. Rabbi Devorah Marcus of Temple Emanu el welcomed people to the celebration which begins the days of introspection before Yom Kippur, “Day of Atonement,” the highest holy day of the Jewish calendar year. The Tashlich service also ushers in Rosh Hashanah, “Head of the Year,” the start of the Jewish year. “Tashlich is to commemorate our casting away our sins, and to look at ways that we can improve the way we live,” said Cecile Fleetwood, a member of the Temple Emanu el. Fleetwood joined her friends in casting bread upon the water, a symbolic act to cast away one’s sins. And then she ate apples dipped in honey.